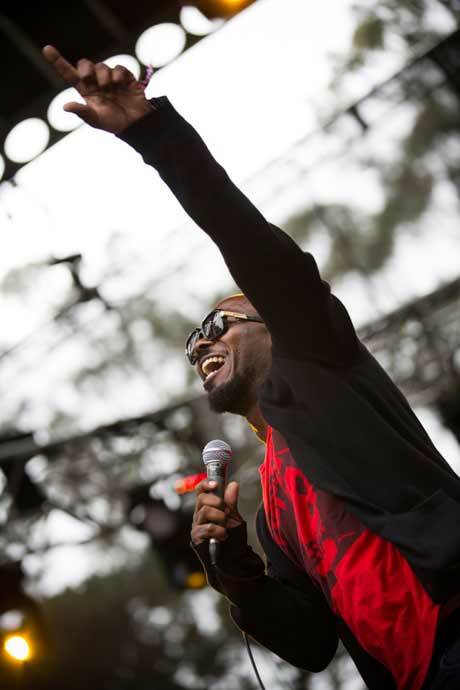 San Francisco's Outside Lands music festival kicked off on Friday with British neo-soul rockers The Heavy hitting the Sutro Stage. Things started off funky with an early afternoon show under cloudy skies. The Heavy cranked out a funk- and soul-fueled performance worthy of adoration. An extraordinary blend of R&B sampling mixed with elements of blues-rock, hip-hop and reggae gave the band a sound landing somewhere near Curtis Mayfield and James Brown. The festival gates had only been open for two hours, so the crowd started mellow, and received the band unenthusiastically. However, front man Kelvin Swaby's high-energy antics soon worked the crowd into a mob of dancing, singing fans. The Heavy moved through their hits early in the set, playing "Shortchange Hero" and "How Do You Like Me Now?" from their 2009 album, The House That Dirt Built . The rest of their set was composed of tracks from their 2012 release The Glorious Dead. In the end fans were reeling from a dynamite performance. Lots of call and response and an overall mega-funky vibe made The Heavy the perfect act to get a great day started.